Last week I met an old CNET friend for lunch in Sausalito (@Fish), and since I had the morning open I brought my plein air kit to paint a bit. I’ve been painting in my studio lately because my next “big goal” is to scale my work up. Paining this reminded me of what I like about plein air painting: the immediacy, fresh, no-fuss impression. Keeps me loose. 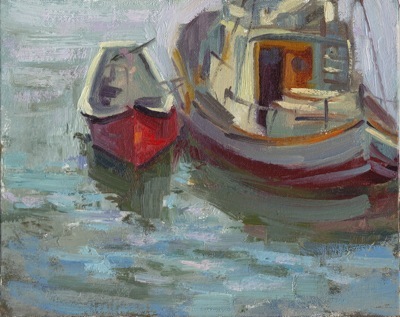 I suppose the best way to grow is to continue to mix plein air, ala prima and studio and try to find the right balance. I am having a lot of trouble painting larger works. Technically, I have to get used to painting on dry (or semi-dry) surfaces, but mentally, it’s difficult for me to sustain the emotional energy I expend on small works. Have you faced these kinds of challenges? How have you made this transition? Previous PostSewing the Sail (after Sorolla)Next PostMeet the August 2011 Pin-up Beauty!